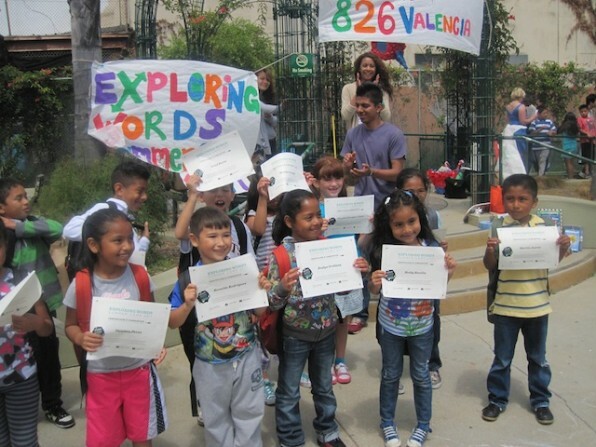 We are happy to say that our Exploring Words Summer Camp, which 826 Valencia puts together every year in partnership with Mission Learning Center, has come to a successful finale! Exploring Words is more than a summer camp—it’s a life experience! For six weeks, the students, who are entering grades two-six, enjoyed full days of reading, writing, and jumping around. Playing freeze tag and practicing superhero yoga were just a couple of their weekly activities. They wrote poems about food and fiction about stars and the solar system. They read about the importance of taking care of Earth and about a variety of animals around the world. On June 29, we celebrated the end of the Exploring Words Summer Camp. Students, parents, tutors, teachers, and interns all enjoyed an action-packed day under the sun at Parque Niños Unidos in the Mission. We also had an honorary guest in attendance, Supervisor Scott Wiener. Wiener represents District 8, which includes the Castro, Eureka Valley, Upper Market, Noe Valley, Duboce Triangle, Diamond Heights, Glen Park, Corona Heights, Buena Vista, Twin Peaks, and parts of the Inner Mission. After the graduation ceremony, during which each student received a certificate of completion, everyone gathered for a delicious lunch provided in part by families of the students. Then students shared their fondest memories of camp with tutors in attendance while others participated in a well-deserved water balloon game. It took me ten weeks to get there. I saw hot dogs on my way to the Chupacabra’s land. The first Chupacabra I met was Max. I asked him, “Are you good or bad.” He said, “I am good.” I played with Max. The big Chupacabras are bad. I kicked them. Then, I went home to Earth.